What do you get for sixty-five dollars at the North Ridge hotel? Star and gin and she dares to touch my hand. I recoil, alas, again, a married man. I think, say “I do,” and carry me in his arms onto that big bird that flies from Kotoka? the toilets, logical, Western: An oasis. outside of the light, Orion twists into a crab in the sky, and a piss is a private affair. for the bush at a second of slack. In spite of it, I like him. upon chests-full of metals. No zhing-zhong, but only the true suffering of the people. Heads must roll, when a big man takes control. wave and terror in his sockets has a swagger when he serves such a king. but the arm holds it tightly in the pit. It growls, then submits. term used by East Africans to refer to poorly made Chinese imports. For the techicol but because we were too many together." Table Mountain is my protector. No boogie man can climb over it. Drape the Lion’s rump, expect rain. Route; We have no cars for driving. season, the stones mottle it like a leopard’s skin. we will spot a lion, and that is the excitement of the walk. "If you see the Buffalo," Williams cautions, "lie down flat. are very bad, stay down wind, and he will not see you. do not run. If you run, you will die." and Swahili and enough of four other languages to get by. Once he went on a long Safari. He had to get a passport. but he doesn't know the address. was young, he went into the bush and disappeared. Four years passed and every one thought he was dead. and looks fiercely serious, until he breaks into a grin. talk in Maa and give each other serious looks. Eluai/ Oseki: kinds of acacia trees. And Freedom Army—Mau-Mau no more. And be-hatted and be-sceptered—Mau Mau no more. In the damp air-con cool of a tourist shop. Where the beer is cheap and no mzungu has ever drunk without being robbed. with “flying toilets” and mosquitoes. sleep altogether, head and feet, head and feet, under a good blanket from the NGO. against damp Kiberia by the river. so close to heaven in the day, so limpid in the morning and restful at the sundown. Matatu: A taxi van; Katt: an herb that is chewed for its intoxicating effect. Bhang blunts: Marijuana cigarettes. Chang’aa: moonshine Mungiku: Kikuyu—The multitudes: A cultist criminal group. Karen: A wealthy white suburb of Nairobi, associated with, but not named for Karen Blixen. 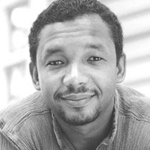 ANTHONY GROOMS is the author of Bombingham, a novel, and Trouble No More, stories, both winners of the Lillian Smith Prize. He teaches creative writing at Kennesaw State University.